Often times we hear of the word IP address but not many of us know what it means and how it affects our presence on the web. Most times some websites restrict some certain IP from some locations from accessing their content. This was the case with Paypal and some African countries. What is the meaning of IP address? Internet protocol simply referred to as IP address is a unique set of numerical numbers (binary numbers) that identifies all devices on the internet or any local network system. The main functions of your IP are to locate your address (where you are browsing from) and identification of your network interface. IP addresses are of basically two types; IPv4 and IPv6 formats. This acronym IPv4 can be referred to as internet protocol version 4. It currently functions as the router for a huge amount of the web traffic currently. This version of IP is used on packet-switched networks. The IPv4 protocol comprises of 4 sets of numerical values ranging from 0 to 255, separated by the dotted decimal quotation. This protocol makes use of a 32-bit address, a maximum value that limits the address field to 232. Take for instance, the IP address of my website TechTimes.com.ng is 67.43.14.98. This unique number or identifier is what is used to spot TechTimes on the Internet. What is simply means is no other website or hardware device has this same unique identifier. If a visitor visits http://techtimes.com.ng, the domain name server systematically interprets the website name "techtimes.com.ng" to the IP address "67.43.14.98." We have three different types or classes of an IPv4 protocol. The class A, which is the smallest class, contains 256 IPs. We have the class B and class C IP addresses also. The internet protocol version IPv6 is actually meant to phase out the earlier version which is the IPv4. This version is far different from the IPv4. The ipv6 unlike the ipv4 comprises of eight sets of hexadecimal numbers in four places and uses the colon sign to separate them unlike the IPv4 that uses a dot sign. Let’s look at an example of an IPv6 address: 2602:0445:0000:0000:a93e:5ca7:81e2:5f9d. There are 3.4 x 1038 or 340 undecillion) possible IPv6 addresses, meaning we shouldn't run out of IPv6 addresses anytime soon, according to whatismyip. Now I believe I have been able t tell you what an IP is and how you can differentiate between the two different types of IPs and even the classes. 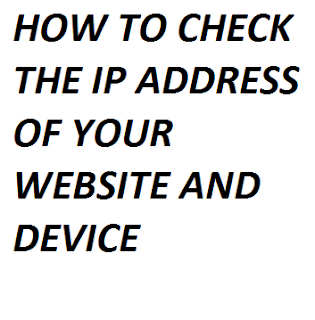 It is time I teach you or walk you through how you can check your devices’ IP address using this simple method. First, go to your device’s browser. Next, type this URL on the address bar www.whatismyip.li. Next, click on go or search depending on your browser. When you have done this, the website you have visited uses its tool to automatically read your device’s IP address and tells you your IP address, location and time zone. Note, websites are identified by names on the web, for example www.myurl.com, and not by it’s IP address because IP is used for networking interfacing and identification. I hope you found what you are looking for on this article, please share to your friends on Facebook.